I think Maritime stuff is cool. And islands. And names of islands. Back in Maine in Casco Bay we have Islands with names like Junk of Pork. Here in the Bahamas we have No Name Cay. It’s the place where we swam with pigs earlier in the week. It’s just all so unique and great. This morning we planned an A to B swim along No Name Cay, a first for us. The wind was blowing about 15 knots from the south, and with the sun in the southern sky, we planned to swim north, wind and sun at our backs. It worked! 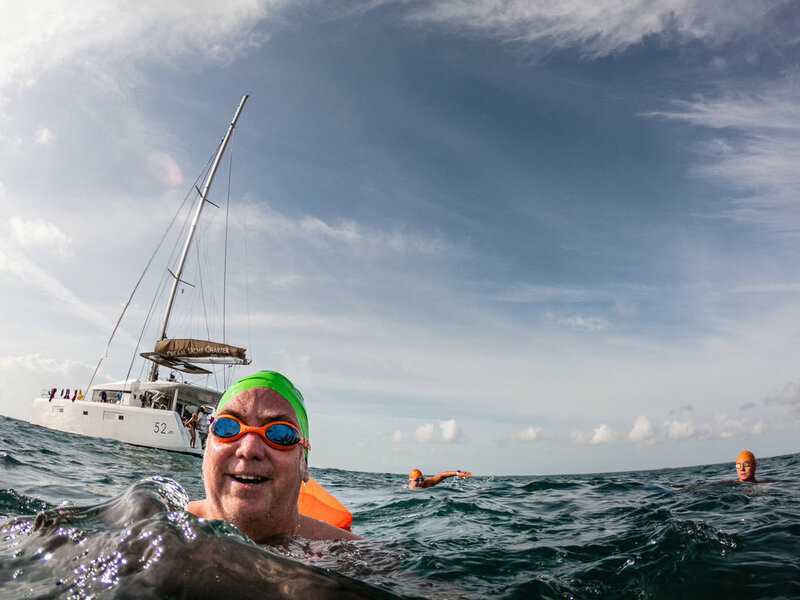 Our swim was a mix of choppy and smooth waters, and included a swim around a big mangrove, with lots of southern ray sightings and a finish near the pigs. Simon concludes our new and spectacular swim with his signature water ballet moves. Next stop: Spoil Cay, where we spoiled ourselves with tacos for lunch, naps and stories. Lies about how fast we used to swim back in the day, a typical pastime on SwimVacation, which I heartily join in on. Heather jumped in for the swimmer portrait shoot with some of her favorite conditions: the soft, diffused light of gray skies giving a luminous pastel glow to the turquoise waters. Cue swimmers. Mind you, preparations must be done before a swim like this. I study charts and google maps, and spy as much of the swim as I can with binoculars. I ask locals. Then for the swim, we make a plan, tell other competent people what that plan is, and make an exit strategy. With all those things in place, we set out for an adventure swim around Spoil Cay. Into the wind first. Always into the wind or current first. It was pretty sloppy and we got stuck in some shallow areas where the waves were breaking, but we made it about ½ way around the Cay when I had the sense I needed to know more about what was ahead. We climbed up onto the beach and spied the remainder of our swim: 2 miles of questionable depth, coral strewn bottom, sloppy channel. So we hiked back to the beach opposite our yacht, lots of oooh aaah oooh aaah as we stepped through the shally rocky sections. We found Heather and the rest of the gang wrapping up the photo shoot, and joined for some group shots. What a swim, what an adventure! Skipper Richie and First Mate Zack snacking on the bridge as they sail us home. A nice curry for dinner, followed by pineapple upside-down cake Molinet and Heather’s famous slideshow from our week. 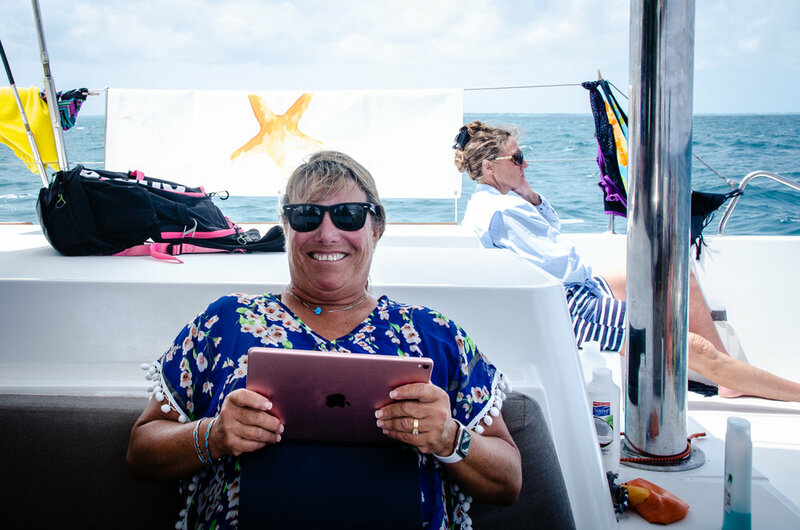 Technology and boats don’t always mix, but we’ve figured out a way to get a portable digital projector down here and project onto the back of our banner. It’s pretty slick and looks great. This group has been such a joy to swim with, and unlike some other trips, all 3 guides got the chance to swim with all of the guests on multiple occasions. Out of the water, this gang took to the yacht naturally, and fell into their vacations with speed and grace. For two weeks, our crew has performed spectacularly and seamlessly. Zack, as always, predicted what was needed by any of us at any given time, and got the job done before we asked. Richie piloted this big boat into the tiniest and shallowest of anchorages and made it look easy. I should mention here that Richie was our very first skipper on the very first SwimVacation back in 2008. He helped me understand charts and wind and weather and depth and how they relate to planning swims. It’s so cool to work with him again. Miriam continues to shine in the galley. Imagine shopping in an Island grocery store for 14 people for a week, storing all the food on a boat, and producing 3 excellent meals a day, not to mention snacks and happy hours. I watch her do it but I still don’t know HOW she does it. SV Guide Simon is steady, funny, and fast in the water. His stroke technique sessions will help our guests for years to come. Photog/guide Heather is the backbone of these trips. She plans everything, swims all the swims, takes all the photos, and sells more trips. We’ll keep her. Some of the crew didn’t get back to the yacht until 5am today after a night of revelry on the island. They’ve earned that fun, and as we face our goodbyes, I’m glad for their grabbing it. Hard to believe I’ll be back in Maine before the day is through. It was my idea so many years ago to house people on a yacht for a week and take them swimming in tropical seas. At the time, I didn’t really think it would amount to much more than that. But in the last decade, I’ve been a witness to how much more it’s become. Heather has generously given me credit for “ideas that bridge the gap between people and experiences they might not otherwise have”. I’ll take that. This week, Tara told Heather that the reason she signed on with us for her swimming vacation was because of our tagline: Come Back Better. It resonated with her, and she knew it was what she needed next in her open water journey. I’m proud of those three words, and the team I’ve assembled that make them a SwimVacation truth. We’ve had 15 guests over the last two weeks who I hope feel that they have returned home just a little better than they arrived. I know beyond doubt that we have come back better for the time we’ve spent in the water with each of them.